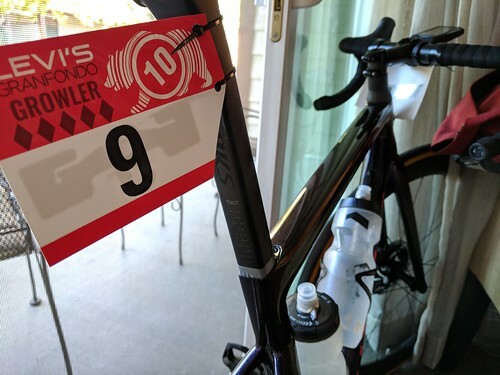 I finished Levi’s Gran Fondo on Saturday and didn’t think I’d be riding much the rest of my trip. My original Sunday plans didn’t work out, so I had the entire day until my 6:30 pm flight to find something to do. I had my fast bike, an extra change of clean clothes, a ride buddy, and a route with promised spectacular views. Why not?! It took some figuring out — would the timing work so I could still return my bike for boxing and shipping? Could I do it and not miss my flight? Could my legs do another ride after Levi’s the day before?? And oh man, I’m so glad I did it. That ride ranks up there among the most beautiful rides I’ve done so far, especially the first 20 or so miles. Holy cow. Here are some of the pictures I got along the way. Click the bike picture to see a full album of all the pictures I took. Alpine Dam and an alpine dame. Rare action shot… John got so far ahead on the descent that he took a nap, woke up, and then got this picture as I went by. It was Fleet Week in San Francisco, so we got to see Blue Angels doing tricks. Once we got about 15 miles from the end, I was really ready to just head back, honestly. Plus it got substantially less picturesque and substantially more suburban. So no more pictures. Oh, on that ride I also met a gal named Lexi Miller (very fast and fit-looking, like every other woman I saw on the road that morning. I felt very humbled. I used to feel fast; this ride reminded me that there are a zillion women faster than me. Get out and work harder, girl! )… anyway, this gal Lexi Miller designs women’s bike clothes! She was wearing this design and now I want one. So cool. We finished riding right about 2:00 pm, leaving me plenty of time to get back to Santa Rosa, drop my bike off, take a shower (my fellow airline passengers probably really appreciated that touch, or would’ve if they’d known the alternative), gas up the rental car (holy crap, gas is expensive! And I had a Prius! 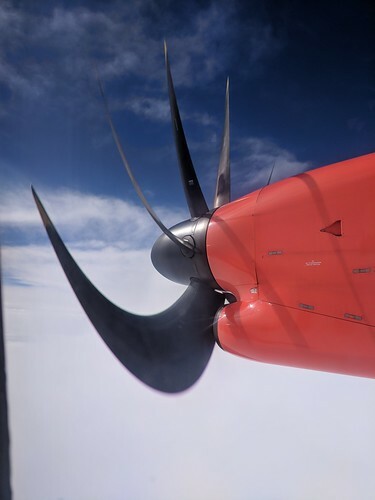 ), get a Subway sandwich, and arrive at the airport with tons of extra time. 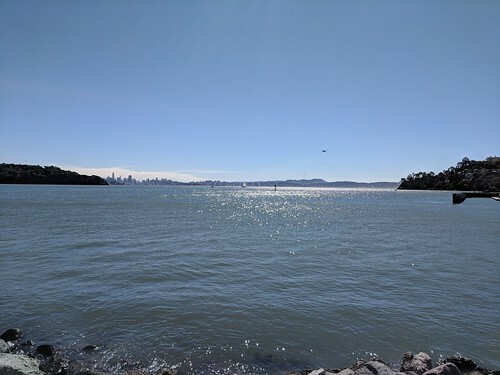 In any case, to summarize, I really can’t overstate how great it was to spend Sunday on a low-key and super-scenic ride with a friend who wasn’t trying to crush it. Just to ride for fun. 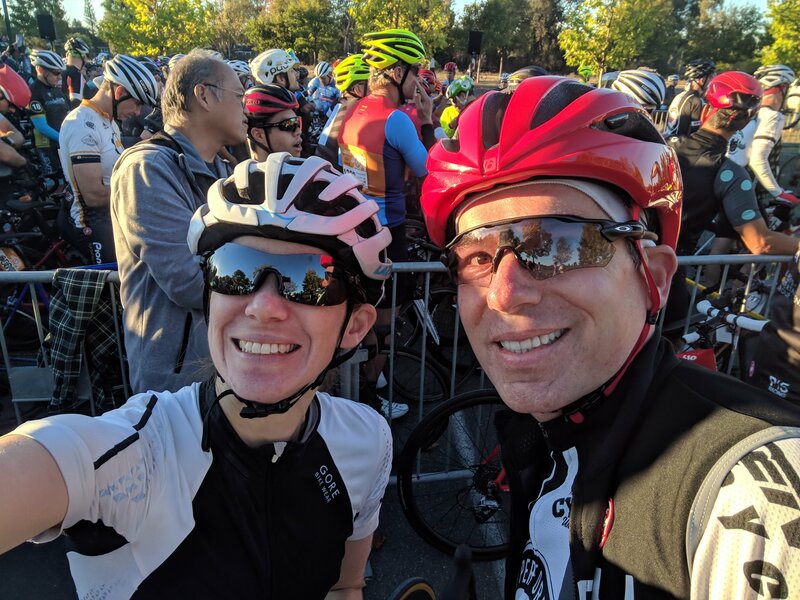 Levi’s Gran Fondo was great, but I had so many hopes and anxiety about it. Sunday’s ride washed all that stuff away. It really took the trip from an 10 to an 11. This is us before the ride. How optimistic and eager we look! John and I started together, but got separated pretty quickly. We were in the first group to go, doing the longest route, and let me say — wow those riders are fast. I had already decided to just ride my own ride, regardless of what other people around me were doing. As a result, although I rode in proximity with other people, especially at the beginning, I spent most of the ride alone. That’s fine; it’s what I expected and it worked well for me. No pressure to push beyond what my leg could sustain. 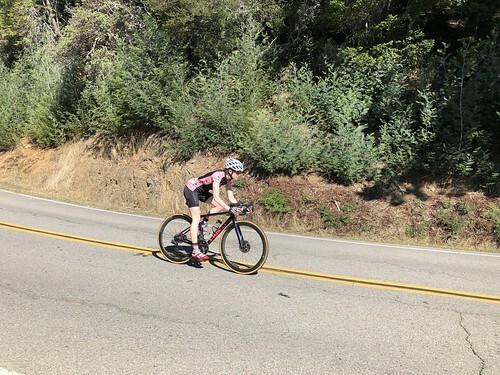 I rode for myself, pacing and going the speed I felt safe and comfortable going… Which was a lot slower than most people on the descents, sadly. 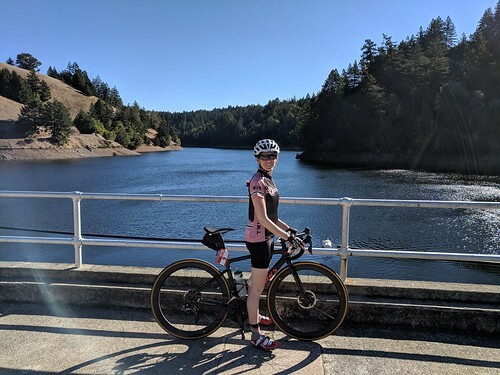 The roads left a great deal to be desired, and on the descents it was beautiful but I couldn’t see much because the terrible pavement, dappled light, and constant winding curves forced me to keep on high alert the entire time. 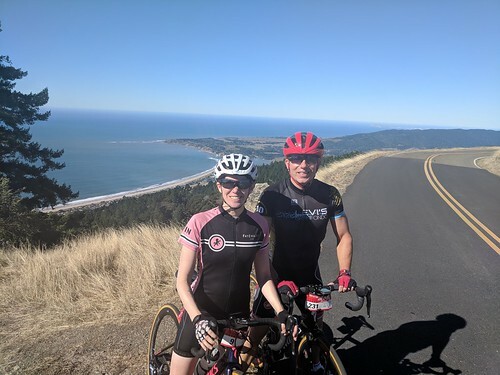 The temperature was perfect, the route included a tailwind on this flat stretch along the coast that was spectacular, and we got so many just amazing views throughout the event. The climbing was difficult, but all our training really paid off and I completed every climb without having my leg fail me. Oh, the other thing I wanted to mention was how cool it was so see so many fast women. Way faster than me. Seriously. There were way more women than I’m used to seeing riding at that level. It was humbling and awe-inspiring at the same time. Here we are about seven and a half hours after starting. Much less perky, but super happy to be done. I ended up with a 7:15 moving time and 7:35 total elapsed time, averaging 16.2 mph — not exactly setting any land speed records, but I finished without my leg having any serious collapses, so that counts as a win to me. Strava says I didn’t have any “achievements” … which just shows what Strava knows. I finished. Next up: I’ll work on getting faster from now on. I’m learning how to manage the illiac artery compression impairment, at least to some extent, so now it’s time start figuring out how to work a little harder, a little harder, a little harder… until I’m fast enough to keep up with the lady my mom’s age who passed me on Levi’s Gran Fondo and who I never saw again. She was fast. I’ll definitely get right on that. Right after I’ve taken a good month or so to do easy recovery-type riding. Hoo boy. Yesterday I did this ride. Now, a few things about yesterday. Due to some commute traffic excitement, I ended up commuting home by bike on Friday. I always, always rest on Fridays because my legs need one or, before a super strenuous ride, two days to rest completely for optimal performance. Even a super-easy slow ride seems to have a very tangible impact in the next day’s performance. The weather was really marginal: thunderstorms and stiff winds, accompanied by the occasional wind gust for excitement. It’s late September; that’s what I’d expect. Unfortunately it coincided with the final peak training ride for the Levi’s Gran Fondo I’m doing on October 6. I’ve been dealing with iliac artery compression in my left leg for the last year and a half. I could write a whole post about this, but the upshot is that when my heart rate gets high, I experience excruciating, crippling pain in my left quad and calf, far beyond anything I’ve ever known from exercise before. It’s like an 11 on a scale of 1 to 10. If I try to push through, the leg weakens until I can’t pedal anymore. 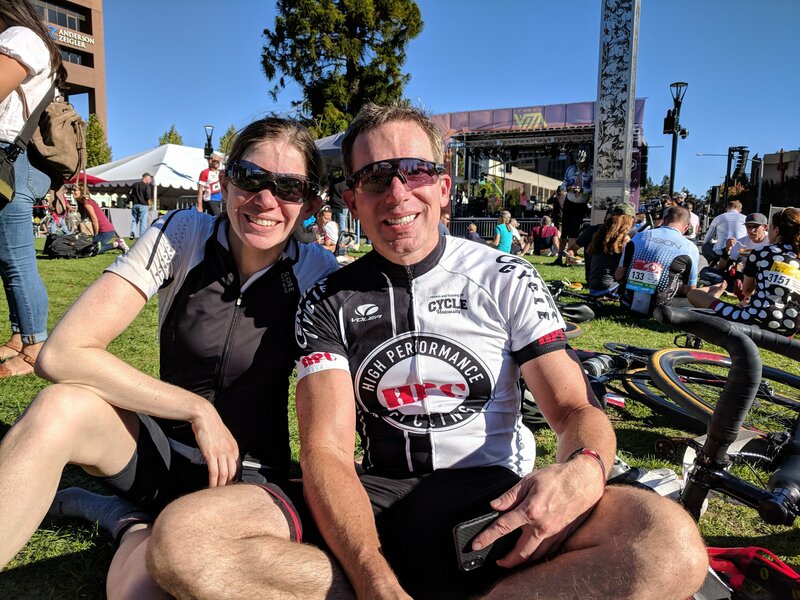 I’ve been training for this Gran Fondo with my friend John Jester, who’s gotten super strong and fast the last couple years. Now, with my leg, I can’t exert myself to chase people who are faster unless I want to experience excruciating agony. It’s incredibly frustrating. Anyway, John and I have been training together, and yesterday we met up for the last of the hard training rides before the Gran Fond itself. We’ve ridden up Squak Mountain a bunch of times the last few weeks; its sustained grade and length make it a perfect training hill. Yesterday as we started climbing, a thunderstorm hit with torrential rain. I’d brought a jacket (the best on-bike rain jacket I’ve ever owned, bar none) and stopped to put it on. This was an on-again, off-again day, as it was in the mid-60s, making wearing too many clothes an issue also. But after that, I struggled. I went slower and slower as my leg failed. When I finally got to the top and saw John completing multiple laps of the top loop, I felt such deep shame at my weakness mixed with misery, frustration, desperation, and hopelessness that I wanted to give up. I wanted to get off my bike and lie down and cry. I kept riding, but after that, it was an endless slog of misery. I feel bad for John, who had a strong ride and had to keep waiting for me; I wasn’t even very good company. It took everything in me to just keep going. I finished, slow and miserable. I did cry when I got home. I’m not optimistic about the Gran Fondo.